I suppose it's about time I made these sparkling little gems. I mentioned them in an earlier post back in September. I mentioned that I saw them "dancing like sugarplums" in my head, and that I would make them and post pics "as soon as I can". Well, a lot of things dance around in my head, and before I knew it November had arrived! But I know that you, gentle reader, will understand and forgive me. Time really flies! 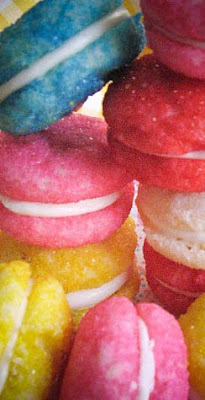 Recipe by Gourmet Magazine 2008. 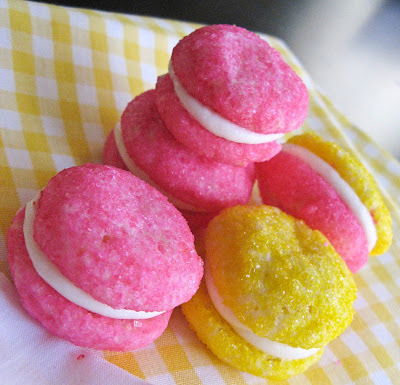 See Glittering Lemon Sandwich Cookies on Key Ingredient. If you decide to make them I'd like to offer a few tips that may make your baking experience a little more enjoyable than mine was. Many reviewers of this recipe (from various websites) said the 2/3 cup of cornstarch in this recipe gave the cookie and "off" taste. I replaced the cornstarch with rice flour. The results were great, and it did not alter the cookie's shape. They look pretty darn close to the Gourmet photo. Do you know what a scant teaspoon looks like? This recipe makes 50 sandwich cookies, which means you'll be rolling 100 marble sized bits of dough through sanding sugar and reshaping them. If you go it alone, I would at least start earlier than my 9 pm venture last night. Instructions say to chill the dough balls for 30 minutes after they've been sugared. I skipped this step and mine still turned out great. I'm looking forward to doing some simple, unfussy cooking this weekend -and stay tuned for some 2 ingredient pumpkin muffins! I hear they are excellent! P.S. Recipe by Gourmet. Sadly, the magazine ends with the November issue this year. Gorgeous! I love the vibrant colors!